The Rental Pro is the perfect choice for small and large texture jobs. It delivers smooth material flow and uniform coverage for a consistent spray pattern with an adjustable material flow control for high production or dial down for more control on orange peel or splatter jobs in tight areas. The RTX900 has an 8 gal. hopper, 25' hose delivering max gpm of .9 and max psi of 60. It also has an 3/4 gal touch up hopper that can quicly attach to the gun with out tools. Weight 60lbs. 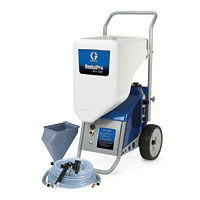 18" x 23" x 41"
* Please call us for any questions on our texture sprayer graco rtx900 rentals in Portland OR, Gresham OR, Milwaukee OR, and surrounding metro area.